I recently visited our school in Playa del Carmen and happy to report that it really is located in a very special setting, just 10 minutes walking distance away from the beautiful white sand beach and Quinta Avenida, the town’s main street. The streets in Playa del Carmen are clearly marked and most of the shops, nightlife and the school are located in a small area, it is very easy to find your way around the town. The school itself is set in its own self-contained grounds with tropical gardens, a cafeteria where you can buy drinks and snacks, a volleyball court and hammocks where you can relax after class! Each classroom is situated in a sheltered outdoor cabana, overlooking the gardens, so you can enjoy the fantastic Mexican weather even when you are in lessons! 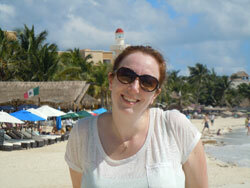 I’ve just come back from 2 weeks in Playa del Carmen and have to tell you about my amazing holiday. If you are looking for winter sun, this is the place to be, even at the start of November we were experiencing temperatures of over 30°c every day, which was a very welcome change from the British winter. Bliss!!! The hub of the town is the Avenida 5, a pedestrianised street which runs parallel to the beach and stretches right across the town. This is the place to come if you want to go shopping and there are plenty of bars and restaurants where you can get inexpensive Mexican dishes and of course sample the local cerveza. Try to think of a typical day in your Spanish class. 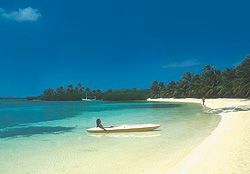 Now imagine learning Spanish just 5 minutes on foot from beautiful white sand beaches and turquoise blue Caribbean water as far as you can see. It sounds like paradise because it is! 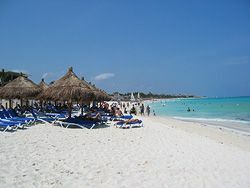 Playa del Carmen, Mexico was the most beautiful place I can imagine for a Spanish course. I just returned from a trip there, had a great time and was so impressed with how fun-loving, friendly, welcoming, and laid-back the people were – I loved it. But who wouldn’t love a Caribbean location where you can also explore fascinating Mayan ruins, visit water parks, and try all kinds of water sports?! On my first evening in Playa del Carmen, I took a stroll along 5th Avenue, or “La Quinta” as the locals refer to it – the main commercial, pedestrian boulevard in the city. Here you will find no shortage of sidewalk cafés, charming Mexican handcraft shops, lively bars, night clubs, and a range of restaurants wide enough to satisfy anyone’s appetite! And once you’re done exploring ‘La Quinta’ you should try 30th Avenue between Constituyentes and 34th Avenue which also has a great selection of incredible restaurants with authentic Mexican cuisine! 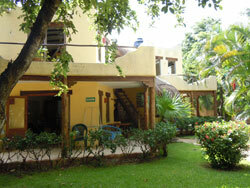 Playa del Carmen – Learning Spanish in Paradise! 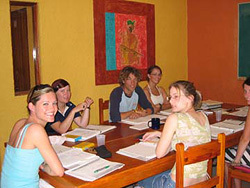 Look no further than Playa del Carmen, Mexico (or “Playa,” as the locals call it) in deciding where to take your Spanish language course abroad! I couldn’t have dreamed of a better experience than one immersed in the language, culture, and adventure in the magnificent Riviera Maya. I just returned from my Spanish course at the school in Playa, and words are not enough to describe the splendor of this place – you must live the experience yourself! Playa’s excellent location also offers a wide variety of one-day trips around the region — including Cozumel, Isla Mujeres, Cancun, the Mayan ruins at Tulum or Coba, the ecological water parks Xcaret and Xel-ha, and Hidden Worlds Cenote Park, which gives you the unique opportunity to do some swimming, diving, and exploring one of the largest collections of freshwater, underground caves in the area! If it is adventure that you seek, you are sure to find it in and around Playa. I ended up spending 5 fantastic weeks in Playa del Carmen, Mexico this summer after I graduated University and it was the perfect laid back atmosphere to practice my Spanish in. Playa has something for everyone; less fast paced than Cancun, but still offers enough clubs, restaurants and shopping for those who can’t live without their creature comforts, not to mention turquoise water and white sandy beaches just a stone’s throw away from the school! Adventures in Playa del Carmen!!! 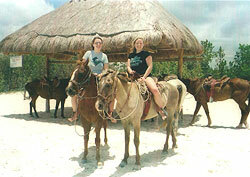 My time in Playa del Carmen and the Yucatan peninsula was the biggest and best adventure ever! I had more amazing experiences in two weeks than I ever imagined possible. I spent my first few days at my Spanish school in Playa del Carmen being utterly dumbfounded by the incredible blue of the Caribbean Sea, the whiteness of the sand, the warmth, the sunshine… the just plain TROPICALNESS of everything! I felt like I was living on the best holiday postcard you have ever seen, or, better still, living on the exotic set of a James Bond film!